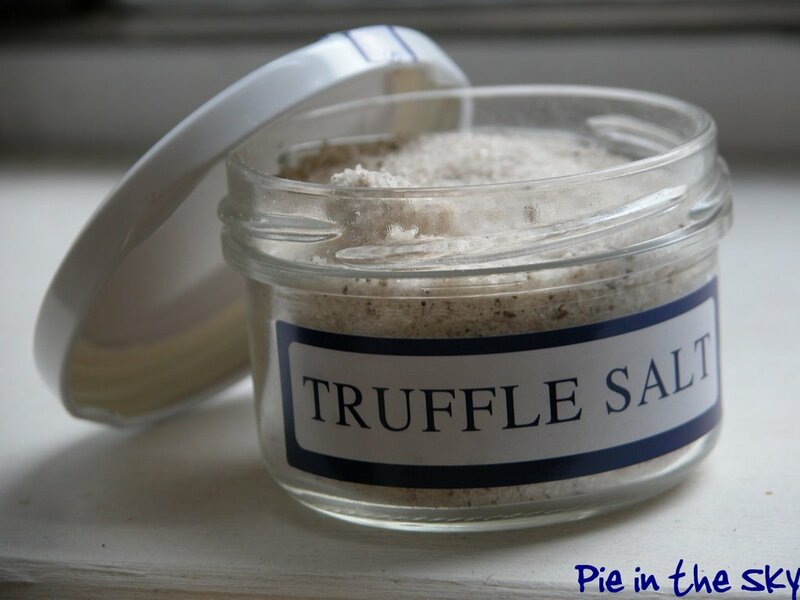 When we opened the jar, the decadent, earthy smell of truffles immediately filled the room. We peered in awe at the tiny dark chips of the precious mushroom that flecked the glittering crystals of salt - surely those miniscule flecks weren't responsible for the holy fragrance purfuming the whole apartment? Gingerly, we tasted it...and that's when the walls started melting. All I'm going to say about this product, procured at S.O.S. Chefs, is that you must have it. Ever had one of those dining experiences where your food was so good it (almost) made you cry - the perfect bite of tender lobster; the cool, creamy forkful of ideal key lime pie; the garden-fresh watermelon you plucked off the vine and cracked open by hurling it at a stone...well, those are mine. But I digress. Food that makes you cry. THIS IS ONE OF THEM. All the rumors about truffles - aphrodisia, transport to the gods, harbinger of wealth - they're true. But seriously, this stuff is like CRACK. Yesterday I caught myself sticking my fingers in it and eating it by itself. I have to hide it in my "very dear and special seasonings" hatbox to keep it from miraculously disappearing. 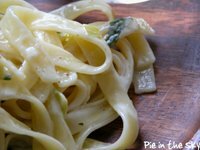 I've taken to preparing simple foods just to be landscapes for its remarkable flavor - on the first night that the truffle salt came to be with us, we has fettucine in a cream sauce. It was out of this world. We ate in reverent silence. 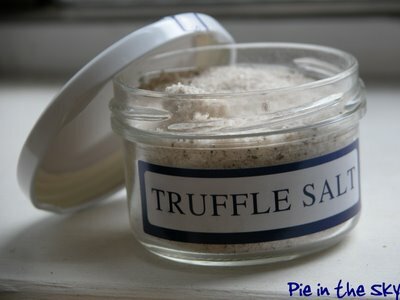 If a real truffle isn't on your shopping list (local market price is a minimum if $55/oz here, so it definitely isn't on mine) truffle salt should be. If you want me to, I will help you get some. Just ask. The jar is $15. It will change your life. oh, i will have to get some. how do you use it? would you replace regular salt in you recipe or should you just use a pinch or two as a finisher/condiment at the end of cooking? When you come home July, would you bring three jars...one for me and two others to give as gifts (with this post) to Shannon and Judy for their birthdays. The way you decribe it; I know we'll want what you're having! I'll send you a check. thinkingwoman - either! depends on how truffly you're going for. It's not too salty, so using it exclusively to salinify food would make it run out a bit quickly. mom - done. $45, please. ;) do you want me to mail it to you? $15 a jar! That's a better price than I've seen here in a local cheese shop. I think she's charging well over $20 for the same thing. But isn't it wonderful stuff? Is it better than truffle oil? ;) I love truffle oil and love coating filet mignon with it after its cooked. Mmmm. That fettucine looks delicious! Cheers! I love the idea of you sticking your fingers in the jar just for the occasional taste. Sounds excellent. Thanks for the heads-up. Mmmm...I would love to get some! They really need to take orders via the Web, so those of us who can't just pop up to NY can have some too! kathy - would you like me to send you some? email me your mailing address! My favorite new thing is truffle butter, or truffle oil popcorn. I bet this salt would revolutionize my revolution, covering more ground and delivering truffly flavor without making the popcorn overly greasy. It's on my shopping list for sure. i wish i hadn't sworn off SOS Chefs for trying to kill me because this almost makes me want to give them my money again. a-train - truffle popcorn is a GREAT idea. thanks! ann - well, MY interest is piqued. in what regard did SOS try to kill you? If I buy it will you send me some of that pasta??? ivonne - only if you send me a slice of that lemon tart!